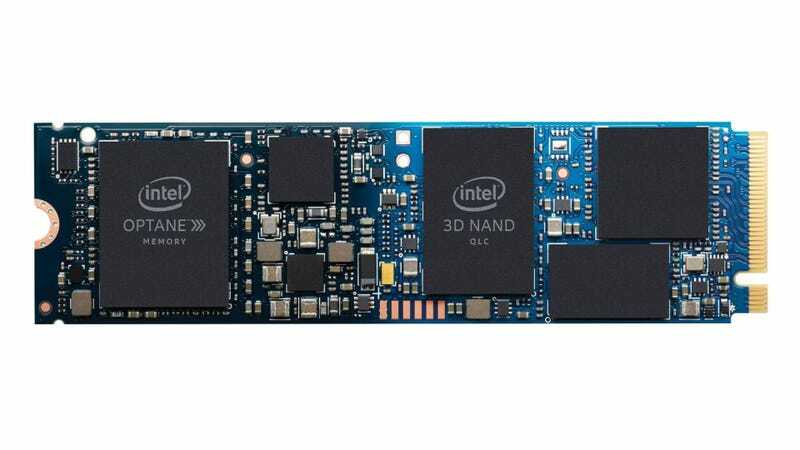 For the new H10 drive, the idea is that by combining 16GB or 32GB of Optane Memory—which acts a storage cache to speed up a regular SSD—and then pairing that with traditional 3D QLC NAND storage combined on a single M.2 stick, the H10 will hog less space on motherboards and make it easier to put Optane tech in laptops from major manufacturers, like Dell, HP, Asus, and others. By using Optane Memory as a cache to speed up app launch times and marrying that with a traditional SSD, Intel is hoping the H10 will deliver super fast read and write speeds with the volume you’d expect from a big storage drive. Previously, to get the benefits of Optane Memory, you had to have at least one M.2 slot open for something like Intel’s M10 drive, while your actual storage lived in a separate slot. Now that’s fine in a desktop where there’s typically a lot more room to tack on extra drives, but that doesn’t really apply to mobile systems like a 13-inch ultraportable. The big benefit of combining Optane Memory with a traditional SSD is that Intel claims the new H10 drive will be able to open typical productivity apps up to two times faster, launch games up to 60 percent faster, and open large media files up to 90 percent faster— all while multi-tasking.